The Chantry Chapel of St Mary the Virgin built by the townspeople of Wakefield in the mid 14 century as an integral part of Wakefield's new stone bridge (which replaced earlier wooden bridges) across the River Calder. the first licensed in 1356. Its purpose was to provide for a priest to say mass for the souls of the dead to reduce their time in purgatory. It was closed as a mass-house in the mid 16 century on the Dissolution of the Chantries (as part of the Protestant Reformation) It was bought by a member of the Savile family of Yorkshire magnates and was later given to the Trustees of the Wakefield Poor (now the Governors of the Wakefield Charities). For almost three centuries it was used for many secular purposes - as a cheese-cake shop, a corn merchant's office and a newsroom, for example, and finally as premises for a tailor. It was leased in the latter part of the 18 century by the West Riding magistrates (the body responsible for maintaining bridges) so that they could keep it in some repair and thus avoid the bridge itself being weakened. The magistrates widened the bridge twice on the upstream side. It began as about 10ft wide and is now about 30ft wide. The Chantry re-opened for congregational worship in 1848 and was used for six years (until a new church was built) as the parish church of the new parish of St Mary. A new front by Sir Charles Nicholson replaced Scott's front in 1939, after the new bridge of 1933 had taken most of the traffic from the medieval bridge. 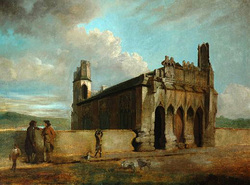 The Friends of the Chantry Chapel were formed in 1990 to raise funds for the repair and maintenance of the building. In the 1990s the Friends raised and spent some £100,000. This paid for full repairs or replacement of the stonework, a new lead covering for the roof, new lighting and a good heating installation. A re-drawing of parish boundaries at the end of 1999 brought the Chantry into the care of the Dean and Chapter of Wakefield Cathedral.